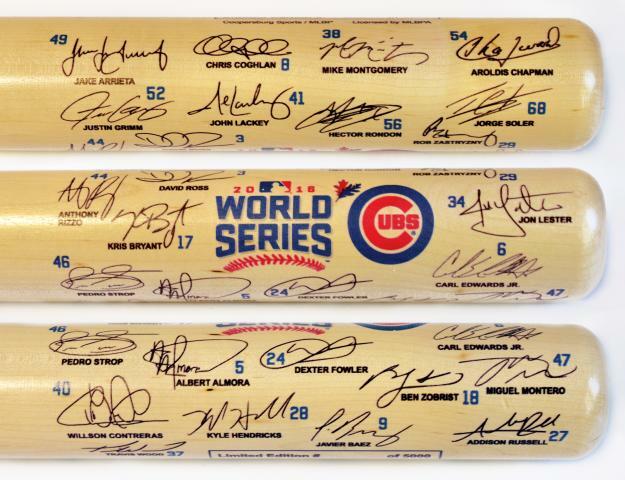 Due to a previous contractual agreement, signature of Jason Heyward does not appear on this bat. The Chicago Cubs are headed to the World Series for the first times since 1945! The Cubs defeated the Dodgers in a competitive and entertaining NLCS to win the NL Pennant and now face the Indians in the World Series. 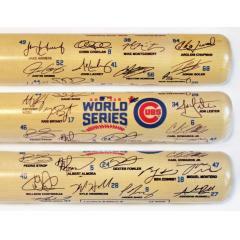 We are proud to offer loyal and diehard Cubs fans this limited edition Full Size Team Signature Bat to celebrate the team's 2016 World Series appearance and NL Pennant. These full size bats feature the facsimile signatures of the members of this year's team and make a nice addition to any collection. Order yours before they are gone! Due to the limited nature of this offer we must charge your credit card for the full amount immediately upon taking your order. This policy ensures we reserve a bat for you We will confirm your order by Email. This bat is not game used. Please allow 4 to 6 weeks for delivery.